Mostar is the fifth-largest city in Bosnia and Herzegovina and has an interesting history as well as a striking layout. The famously divided city spans both sides of the Neretva River, with a vibrant community of Bosniaks and Croats occupying either side of this city. Connecting the two regions is the Old Mostar Bridge, which was constructed in 1566 . Fly directly to Mostar International Airport, or take the train from Sarajevo or Ploce on the Croatian coast. When traveling by train to Mostar, keep in mind that timtables may be unusual or infrequent, and taking the bus may be an attractive option. If you are interested in traveling to and from other towns of interest like Blagaj or Podvelezje, there are plenty of local bus routes that connect the towns each day. If you’re looking for a local bus, you won’t miss it: they are painted a vibrant yellow! The Old Mostar Bridge (Stari Most) is a UNESCO World Heritage Site and a major tourist destination. The Old Mostar Bridge was completed in 1566 after nine years of planning and building. Designed by the Ottoman architect Mimar Hayruddin, this bridge stood for 429 years without fail. This bridge was destroyed as a result of the conflict in Bosnia and Herzegovina, but was reconstructed with collaboration from UNESCO, the World Bank, and the City of Mostar. On July 23, 2004, the bridge was reopened. Not only is it a testament to incredible engineering and design, but to the healing of Mostar after ethnic division. Take stroll in the Old Bazar Kujundziluk near the Neretva River and Old Mostar Bridge in this pedestrianized area of the old city. Stop by the artisan’s tiny stalls as well as handicraft shops offering carpets, jewelry, traditional garments, scarves and pipes. Be sure to bring your camera—the Old Bazar Kujundziluk is in the oldest part of Mostar. Go to the “Turkish House” to be treated to the architectural splendor of Mostar’s past. As it is located near other points of interest such as mosques and historical structures, make it a day destination and don’t forget to give the city a donation when you visit! Don’t forget that it’s customary to remove your shoes when you enter these buildings. Walk by Tito’s Palace. This building is empty and desolate, but it serves as a one of the greatest reminder of Bosnia and Herzegovina’s turbulent past. Hotel Ero is a popular place to stay for tourists. You can travel to the town in about 10 minutes—plenty of opportunity for sightseeing—and visit cafes along the way. If you will be arriving by bus, stay at the Hotel Ero, which is located close to the bus station. The Hotel Bristol is conveniently located in the center of Mostar, along the banks of the Neretva River. You can get a great view of the river from your hotel room, which will be cozy and quiet. 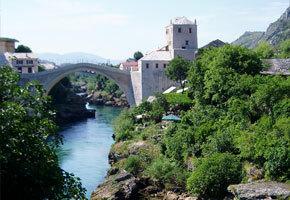 When you arrive in Mostar, you will see that many families offer accommodation in their home for private stays. If you organize your stay in advance, you can have your host meet you at the bus station and take you to your accommodation. You will save money while steeping yourself in the culture of Bosnia and Herzegovina. If you like to walk, Mostar is perfect. Most points of interest are quite close to one another, making travel around the city very easy.